In a medium bowl, whisk together the flour, baking soda, cinnamon and salt. Stir in the oats. In the large bowl of an electric mixer, beat butter, sugars and vanilla until light and creamy. Add the egg and mix to combine. Scrape the sides of the bowl occasionally. In low speed, add the dry ingredients in 3 additions, mixing just until incorporated. Mix in the pecans. Cover with plastic wrap and refrigerate for 2 hours. Preheat the oven to 180°C/350°F; line two large baking sheets with baking paper. Roll 1 rounded tablespoon of dough per cookie into a ball and place onto prepared sheets 5cm (2in) apart. Bake for about 10 minutes or until golden around the edges. Cool in the sheets over a wire rack for 10 minutes, then carefully transfer to the rack to cool completely. 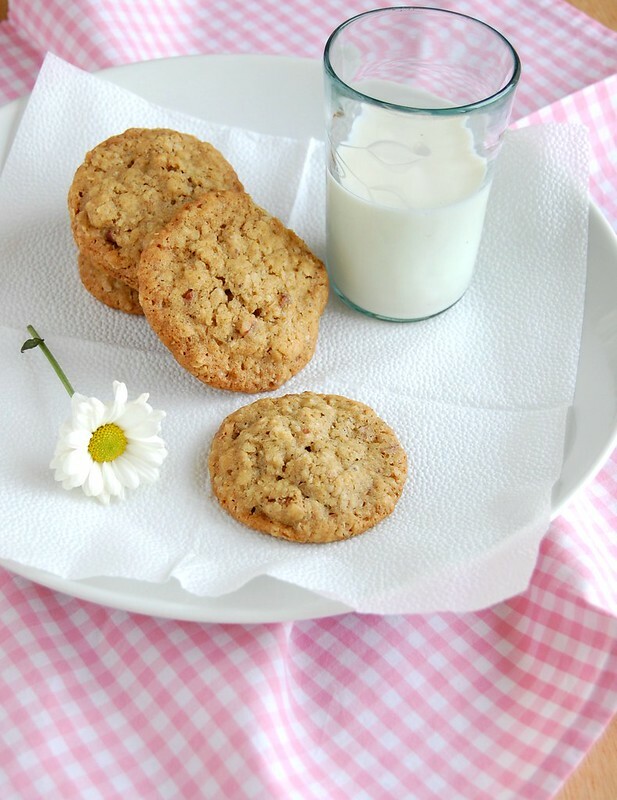 I love these cookies, you can never go wrong with oatmeal pecan! Hey, Natasha - these cookies are not very sweet.